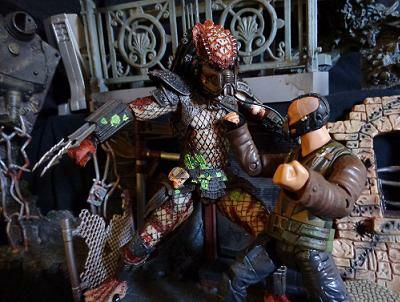 After a long hiatus, we've got another review by Ridureyu, where he looks at some of NECA's Predator merchandise! Take it away, R! 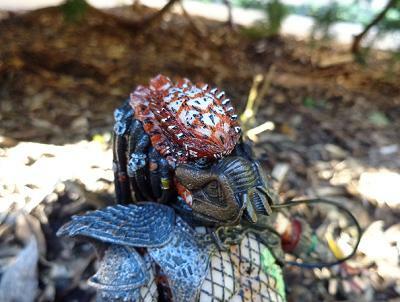 Fun Fact: Did you know that the Predator was originally going to be a savage, one-eyed bug-monster? This idea went far enough that they even had the costume ready, until their first star (Jean-Claude van Damme!) quit, and they went to Stan Winston to redesign the creature. He did such a good job that you can see echoes of the design nearly everywhere, from G.I. Joe to Star Trek (the Hirogen aren't fooling anybody). 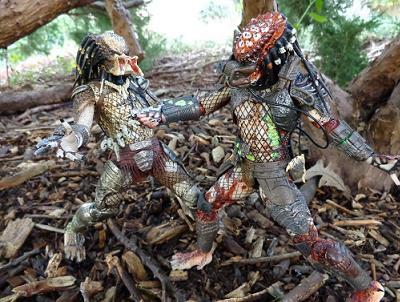 When it comes to the Predator license, NECA has really hit it out of the park these last couple of years. After completing the roster from Predators, they turned their attention to Predator 2, and actually successfully made every one of the ten Predators in that movie! 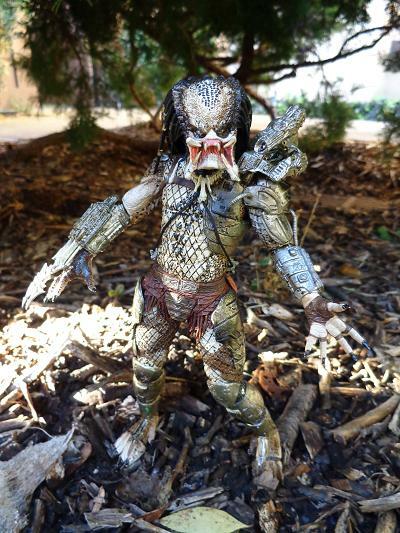 It also helps that the new body type used for the Predator 2 City Hunter had improved durability and articulation over what had been used in previous series. But the classic Jungle Hunter from the first movie has been missing - sure, we got a "Classic" Predator back in the first few lines, but that was the guy from Predators, and he used the old-style body. A Masked Jungle Hunter should be coming in one of the next upcoming series, along with two versions of Arnie's character from the first movie. Right now, Toys R Us is selling an exclusive 2-pack (if you can find it!) 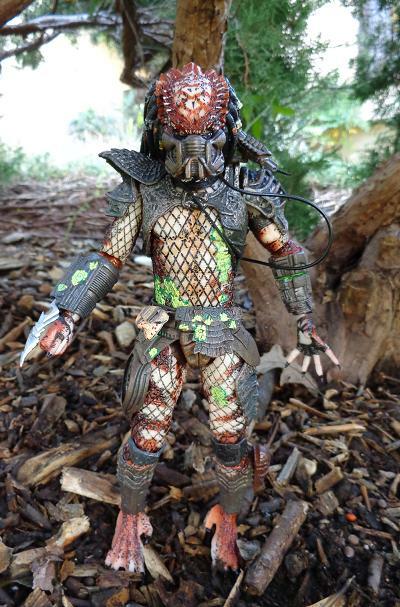 with an unmasked Jungle Hunter as well as a new "Battle-Damaged" City Hunter with a new head sculpt! 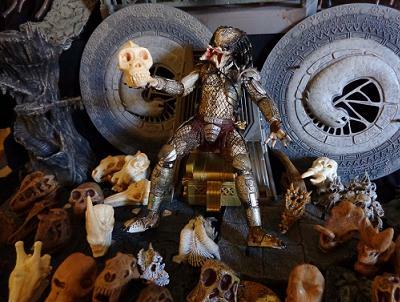 The pack also features some of those trophy skulls from the climax of Predator 2, so if you've been collecting the other 2-packs, you'll have enough for the whole trophy case when they release it. So, how does this pack of figures stand up? Let's take a look! The packaging is standard for NECA multipacks - it's a clamshell, but not an unreasonably thick clamshell. Info on both of the figures is on the back, and the front shows off what you're buying well enough to help you choose the best-looking one from the shelf. NECA today is what McFarlane was ten years ago. When McFarlane toys released their Aliens and Predator figures, they were groundbreaking for the time, and still hold up decently today. But NECA'S current work blows it out of the water! Both Predators use some shared parts, as do all of them in this line, but they also have unique tooling where necessary. The Jungle Hunter is one of the big draws of this set. 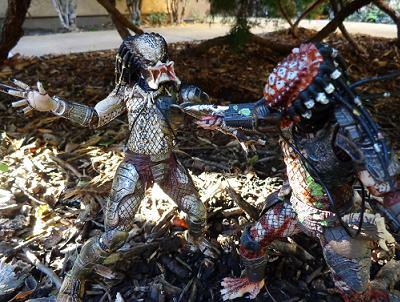 He reuses the head from the "Classic" Predator early in the line, though with an improved paint job. The rest of his body is new or reused from the City Hunter, and takes advantage of the new articulation scheme. 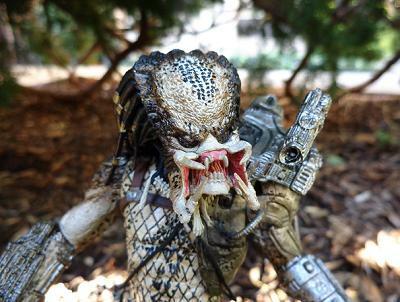 His face is fantastic, catching the Predator in mid-snarl, and really detailing those mandibles well! The dreadlocks are soft rubber, and can be arranged in a few ways based on the pose. His body is just fine, including all of the details in the original Predator's costume, including the little things some might have missed - the tassels on his loincloth, or the tiny trophy skulls slung over his shoulder. 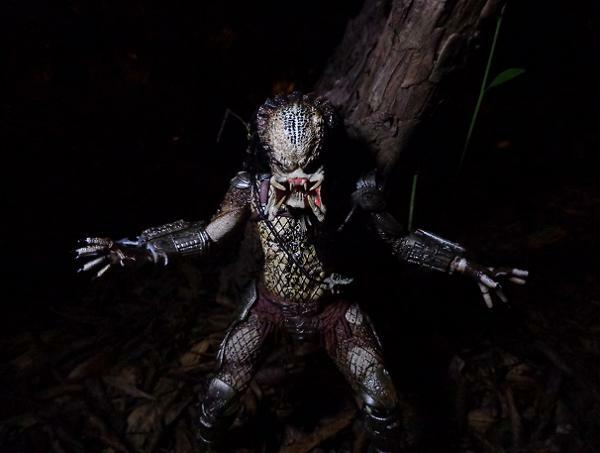 He's pretty basic, but it's the best Classic Predator that we've gotten yet! Rather than simply repainting a masked or unmasked City Hunter, this pack gives us something pretty different. He's got a rebreather half-mask on, which has confused some people. If you remember in Predator 2, when Danny Glover was chasing the Predator toward the end, it took a quick breath or two from a hand-held rebreather. Sure, other Predators have seemed fine in our atmosphere, but maybe that guy was a smoker. Also, he had just gotten shot a bunch of times in the chest, give him a break! The rebreather is an unremovable part of the head sculpt, and is also attached to his body by a tube - this is slightly unfortunate, as now you can't easily swap it out for either of the City Hunter's other two heads to reproduce more of the final battle. Just for added effect, his left arm separates mid-wrist like it did in the movie (though he was not wearing his rebreather then), and the stump looks pretty good except for one issue - the peg is in his arm, not the severed hand. This is really annoying, as it looks bad, though it's more of an issue of articulation than sculpt. Why couldn't they have reversed it? Putting the hole in his arm would have looked a lot more like it did in the movie! Other than that, it's the basic City Hunter body, which was good before and is good now. NECA's paint is generally fantastic, though with a few hit-or-miss spots. The one negative I would point out is that the netting isn't always easy on these guys, but let's be honest - for mass-market, it's fantastic, and not bad enough to warrant a score reduction. Part of the selling point is "Battle Damage," i.e. the City Hunter is beaten up like he was by the end of Predator 2. Well, he's certainly got blood in the right place, and it's a great shade of neon green. It's too bad that it doesn't glow in the dark, but that's no biggie. As for the rest of his body, he's in movie-accurate colors, his skin looks like skin, and his armor is weathered and looks like armor. I'm appreciating the flesh-toned plastic that NECA has been using lately, as it makes these guys look a little more "real." 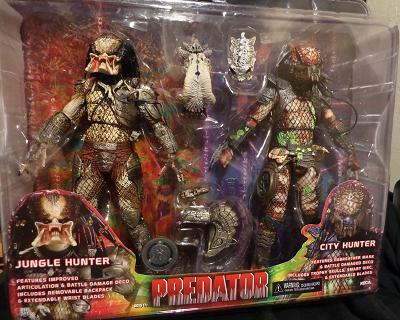 The Jungle Hunter's paint is also on-target, and you can really see the differences in both Predator designs when they're side-by-side (though I have no idea how this makes the City Hunter more "Urban and hip," like they said). His head is better-painted than in the original release, which is awesome. The rest of his body is also an improvement on the original, whether it's from a few movie-accurate details or just better and cleaner coloration overall. Although his netting is a little sloppy, the rest of Jungle Hunter is fine, including his chest hair - he is decidedly more hirsute than his urban brother. Hilariously, the Jungle Hunter is also battle damaged - he's got a spot of blood on his ankle, and if you remember the movie, he got shot there really early on (not that it slowed him down much). The articulation in the new Predator body is so far superior to the older body that I want to just give these guys four stars and call it a day. To compare, my (first) Berserker Predator could barely move at his v-hip joints, and his knees snapped immediately. These guys have ball-jointed hips, and DURABLE knee joints! Although you need to move everything to make sure nothing is stuck, they all worked smoothly for me. 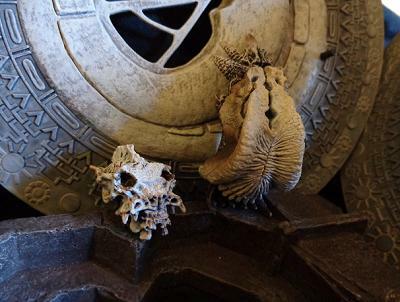 There is some concern about the legs becoming loose, and that is a problem with NECA, so be warned. Also, both Predators have some arm movement issues thanks to their armor, and in the Jungle Hunter's case, he's got some tubing that limits one of his arms. Their wrist blades retract and extend, though they feel a little brittle. One of the City Hunter's hands keeps falling off, though it's not broken, or anything. The City Hunter's removable hand has that peg issue I mentioned, too. The loose legs, impeded arms, fall-off hand, and annoying wrist peg all combined are worth a star from otherwise-stellar articulation. The Accessories score kind of needs to be read in a few ways - if not for two specific things, they would get all four stars. One drawback is minor enough to barely be counted, but the other is worth knocking off a whole star, depending on a few things. The Predators come with two trophy skulls, Jungle Hunter's shoulder cannon, and a razor smart disc. The trophy skulls are fantastic, representing two of the unidentified alien skulls on the City Hunter's display shelf. They are sculpted well, painted great, and even have little slots to mount on that upcoming wall. I have zero complaints about them! The Jungle Hunter's shoulder cannon looks great and is articulated well, but has one problem: it doesn't stay on his shoulder! its tiny peg and his shallow slot aren't worth much, and his dreadlocks are likely to push it off, anyway. You can't really do much with the shoulder cannon if you really want to get some good poses out of it. The third issue is the smart disc, or rather the lack of one. NECA has always had quality control issues, though rarely anything too bad, but this is reaching Mattel levels! The Lost Predator figure was advertised as coming with a smart disc, but did not - its packaging didn't even have a slot for one, so you can assume that it was cut out in the production process but just not removed from the packaging in time. The packaging for these guys advertises a smart disc. The City Hunter has a holster for a smart disc. His hand is posed to hold the smart disc. The smart disc figures into a lot of his battle damage (and death). And there is a slot in the plastic tray for a smart disc. But there is no smart disc. This is not just a design change, either - NECA has stated that if you email them at twitter@necaonline.com and provide evidence of your purchase, they will mail you a replacement smart disc. But how many people are going to visit Twitter to find that out? Anyway, I emailed NECA, and they gave a prompt, professional (not a form letter!) response, including a tracking number for the disc. Their excellent customer service saved this rating, which would have been a lot lower otherwise. Thanks! So, in short - two great skulls, one cool-looking shoulder cannon that won't stay on, and one quality control no-show, although they are actively fixing it. I've got to give it to them, these toys are fun! The new Predator body is really a good thing, as you can play with it. 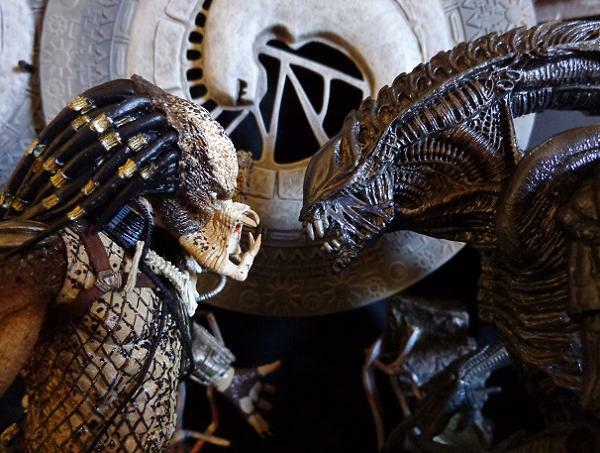 Previous offerings by McFarlane and NECA were kind of stiff and pre-posed, good for setting up figures on a shelf, but these are the Predators! They should be stalking all your other action figures! 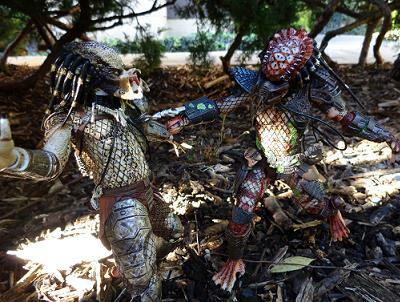 And it's kind of sad that it took until this recent for modern Predator toys to be as fun as the old Kenner toys. Just watch the fragile parts or loose joints. At $30, you are paying $15 for each figure, which is a fairly good deal for what would be roughly $20 individually - but expect the secondary market price to shoot up, as it unfortunately has with the other 2-packs. There is a lot of re-use, but the City Hunter is roughly as unique as one of the Lost Predator figures, and the Jungle Hunter is a sorely-needed figure, unless you managed to score one at SDCC. Since you probably didn't, this is awesome! Besides, this means that you're paying just a little more for two figures than a MOTUC figure sells new, not even factoring shipping into it! Again, watch out for those loose legs, though you won't be able to spot it in the packaging. And remember to send away for your replacement smart disc! Aside from some accessory and articulation issues, these figures are fantastic. 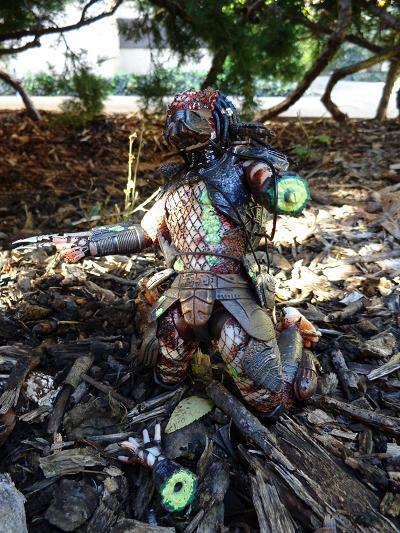 The Jungle Hunter Predator is a necessary part of any Predator collection, and the battle-damaged City Hunter is really unique, too! This product was purchased by the reviewer. Photos and text by John Morey.